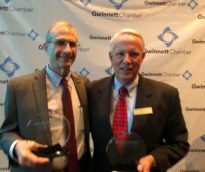 Gwinnett, Newton and Rockdale County (GNR) Health Departments is extremely proud to announce our health director, Lloyd M. Hofer, MD, MPH, has won the Distinguished Leader Healthcare Award through the Gwinnett County Chamber of Commerce. Dr. Hofer has served as the CEO and Medical Director of GNR Health Departments since 2002. The GNR Health Departments provide preventive care to our communities, with clinical services including adult and child immunizations, breast and cervical cancer screenings, family planning, dental care, lab tests, school hearing and vision screenings, STD testing and treatment, case management for at-risk children, WIC nutrition services, and more. Dr. Hofer has leveraged his experience in both the public and private sector to help grow clinicians, expanding both the capacity and knowledge base of the healthcare sector. He provided mentorship and preceptorship to physician residents from the Emory School of Medicine, Gwinnett Hospital System’s Graduate Medical Education Programs, and the Centers for Disease Control and Prevention’s Preventive Medicine Residency. In the wake of the 9/11 attacks and anthrax bioterrorism, Dr. Hofer utilized federal funding to establish a public health emergency preparedness program that brought together key players in the healthcare community to coordinate healthcare preparedness and response. Through planning, exercises, and response to real-life emergencies, this program has grown and strengthened over time, gaining recognition as one of the best programs in the state of Georgia. Under Dr. Hofer’s leadership, our award-winning epidemiology program has grown and exceeded high standards for disease surveillance and outbreak response. Epidemiology staff perform surveillance, investigation and implement disease control efforts for over 70 notifiable diseases, including Tuberculosis, STDs, and emerging pathogens such as MERS, Ebola, and novel Influenza. In 2016 the GNR Health Departments became one of the first in Georgia to be nationally accredited. Attaining accreditation indicates that the GNR Health Departments meet nationally recognized, evidence-based standards. The process of seeking accreditation strengthened the Health Departments’ role in assessing the community’s health and planning for health improvements with our many community partners. Dr. Hofer recognized the value of meeting federal standards for retail food (restaurant) inspections and challenged the GNR Environmental Health team to achieve all nine standards of the Food and Drug Administration’s (FDA) Voluntary National Retail Food Regulatory Program. In 2018, GNR Health Departments became one of only five jurisdictions in the nation to meet these standards. Dr. Hofer will retire December 2018. His perseverance and focused commitment have served Georgia’s communities for more than two decades. He has been instrumental in the improvement of healthcare for all of Georgia through comprehensive, compassionate and evidence-based medicine. Dr. Lloyd Hofer’s career in public service will leave a lasting legacy for the healthcare industry as well as the health of our community for years to come. We are also proud of our Community Partner, Sherwin Levinson, executive director of our partner MRC GEM for winning the Volunteer Service Award. Sherwin Levinson runs the Medical Reserve Corps-Georgia East Metro (MRC GEM), an organization that trains volunteers to engage local communities to strengthen response and recovery during potential crises in Gwinnett, Newton and Rockdale counties. According to the Atlanta Jewish Times article, Sherwin Levinson has made it his life’s mission to educate people on what to do in the event of an emergency in Gwinnett, Newton, and Rockdale counties. Most of MRC’s focus is on Gwinnett and its population 920,000 and in Newton and Rockdale Counties with a combined population of about 200,000. Sherwin recognizes the diversity in culture, language, and demographics across these counties and works tirelessly to ensure that these needs are being addressed. To read more about Sherwin Levinson and the MRC GEM, visit MRC website.